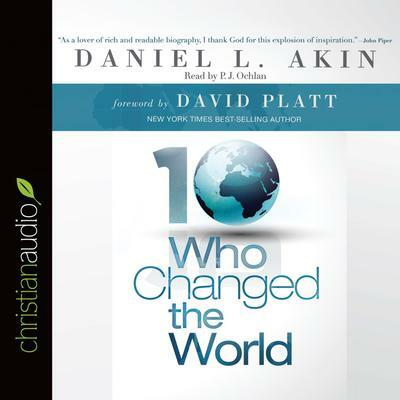 Ten Who Changed the World is seminary president Daniel Akin’s powerful tribute to the transformational work done by some truly inspiring Christian missionaries. With each profile, he journeys into the heart of that gospel servant’s mission-minded story and makes a compelling connection to a similar account from the Bible.David Brainerd (1718-1747; missionary to Native Americans) reminds Akin of Paul’s missionary life in 2 Timothy. The faithful ministry of George Leile (1750-1820; missionary to Jamaica) is aligned with Galatians 6.William Carey (1761-1834; missionary to India) lives out the Great Commission of Matthew 28. There are parallels between Adoniram Judson (1788-1850; missionary to Burma) and Romans 8.Lottie Moon (1840-1912; missionary to China) displays the power of a consecrated life described in Romans 12. The work of James Fraser (1886-1938; missionary to China) illustrates Revelation 5. Eric Liddell (1902-1945; missionary to China), his life documented in the film Chariots of Fire, illuminates Hebrews 12. Together, John (1907-1934) and Betty Stam (1906-1934; missionaries to China) embodied Psalm 67.William Wallace (1908-1951; missionary to China) was a shining example of Philippians 1. Jim Elliot(1927-1956; missionary to Ecuador) is a bold reminder of Psalm 96.